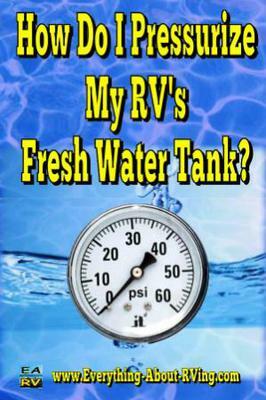 How Do I Pressurize My RV's Fresh Water Tank? I keep hearing statements like you need to pressurize your fresh water tank. Exactly what does that mean. If the tank has water in it, and you turn the pump on then turn the faucet on, isn't that supposed to pump the water through the faucet? I am new to this so please bear with the fact I know not a lot of things that would be helpful. ANSWER: Hi Dorothy, I am going to assume that based on your statement above that your RV is equipped with a fresh water pump and that when you turn on the pump and turn on one of your RV's faucets that you get water. So what does pressurizing the fresh water tank mean? Well, prior to the early 1960's when less expensive on-demand RV water pumps became available; RVs did have tanks that needed to be pressurized with air to get the water to flow through the faucets. Because these tanks had to pressurized with air They were usually cylindrical and made of metal. They held less water and were a lot heavier than the fresh water tanks that are used on RVs today? The only advantage that the pressurized fresh water system had over the on-demand fresh water systems of today is that a pressurized water system was quiet when you used it, because there was no water pump noise. The big advantage of the on-demand RV fresh water systems of today is that the fresh water tanks do not have to hold any air pressure so they can be made of lighter materials that can be molded to fit the RV's configuration which allows them to hold a lot more water than the older, heavier metal tanks used in the old pressurized system. The bottom line is if you own an RV manufactured after 1963 it probably has an on-demand fresh water system. The good news for those folks that own these older RVs can have their pressurized system changed over to an on-demand system that will allow them to carry more fresh water. The thing is that most people that own these classic RVs will not usually upgrade to modern type systems, because they want to their vintage RVs in vintage condition. So as long as you are getting water out of the faucets of your RV with the water pump on, you do not have to worry about pressurizing your fresh water tank. Comments for How Do I Pressurize My RV's Fresh Water Tank? I also have a pressurized tank in an old Trailblazer camper. I cannot find any paperwork on it. Is there any way to find out what the recommended pressure for the tank is?